Lou Fauteux’s robo-fried dream won’t die. For 24 years he has toiled away on the CompuFry, a computer-controlled deep fryer capable of cooking in non-ventilated places. The CompuFry has a robotic basket and enclosed air-filtration system. At about 1.2 metres tall, it looks like a large household oven on wheels. But the entrepreneur and inventor has encountered plenty of deflating moments in his business pursuit. A team of managers from McDonald’s, for instance, visited in the mid-1990s and, despite saying they were impressed, never came back. In fact, Mr. Fauteux, who spent two decades at Garland Canada Inc., a supplier of commercial food-service equipment, set the project aside a few years later for a period after not receiving much interest. “I put it on the shelf and said, ‘Forget this, this is ridiculous… I’m not going to burn myself out over it,’” he laments. 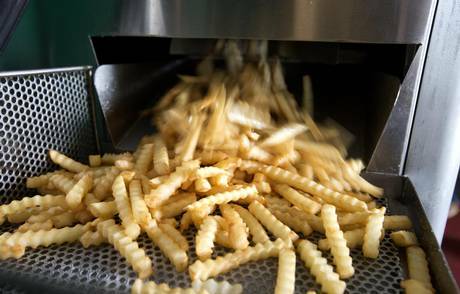 Mr. Fauteux estimates that he and an engineer have spent 6,000 hours at their facilities in Lac-Brome, Que., east of Montreal, and he has invested more than $1.5-million in what he calls the future of fast food. “I’ve spent a fair bit of money on this thing, but it was my money. I wasn’t at the mercy of the banks or anybody else,” he says. 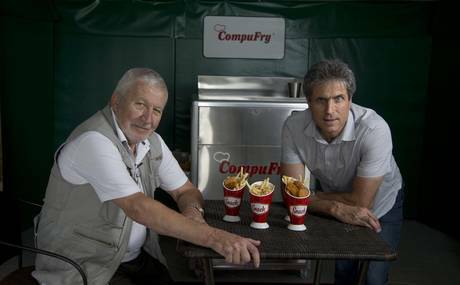 With a price tag of $25,000, CompuFry isn’t intended to compete directly with open-vat fryers, which retail for about $2,000, but its initial cost is comparable to that of a conventional fryer once you include the exhaust system. He points out that open-vat fryers also have “ongoing labour and operating costs.” Return on investment for the CompuFry takes less than a year, he says. Fast-food industries are starting to embrace new technologies and sustainable practices, he says, so the timing seems to be right. But persuading quick-service restaurants to bite is proving to be a challenge. 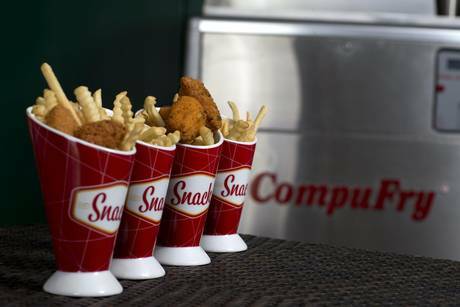 The Challenge: How can CompuFry break the paradigm and convince the fast food industry that its product has merit? I don’t think any big chains will look at you until you have a track record, so you could find somebody that is growing and try to get into their new locations. Foodservice and Hospitality magazine does a top 100 every year and it has a lot of estimates surrounding sales and who is growing. That’s how I’d find potential chains – when you get to the bottom of that top 100 you’ll find the smaller, independent chains that are growing. CompuFry has to be competitive with existing products, so it’s not just about the cooking time but the recovery time, because it’s all about throughput with the big chains. So if you check all these things off and have a good product you’ll want to approach the equipment-purchasing department at a big chain. If they don’t have equipment purchasing you want to approach the construction and operations departments at the same time so they don’t feel like you’re going over anyone’s head. The operations guy you’ve got to show the benefit of saving money and not slowing down, etc., and the construction people you show they don’t have to go through vents. The big thing when we are handling new quick-service concepts – especially those wanting to be franchise-able – is keeping startup costs down. This could be huge where you don’t require an exhaust hood. One quick-serve concept we did was only a 900-square-foot concept and I think they spent over $100,000 just on hoods and venting. It would be a phenomenal approach to make the startup costs a part of the CompuFry branding; it’s definitely why we would be interested in such a product. He should target quick and developing franchises in small spaces by going to the franchises themselves for demos. Also, go to trade shows even though they’re a pain and there are a lot of vendors there. They are still an effective way of getting the product out. Unfortunately, in the space he’s in, I think it’s a lot of hard work, a lot of banging on doors, a lot of doing demos, going to trade shows, getting the product visibility – at the end of the day, sales and marketing are what either makes or breaks it. I looked at a couple of his competitors and they look very well established. His website is very basic – it’s not interactive, it has one video and a few bullet points but it doesn’t give me the confidence as a consumer to be really going after this. Even the CSA and other certifications information, that should be on the first page loud and clear, is on the bottom of the second page. The video can be somewhere near the bottom – give me the meat and potatoes right up front – that way as a busy entrepreneur or franchisee I know what it is I could be purchasing. It definitely needs work. If I’m a customer, I don’t know what I’m buying – it doesn’t tell me the output, how many portions, how quickly, what size. I want to see everything first before I entertain the thought of getting into those sorts of machines. Look for fast growing, small footprint chains to get your start. Fine-tune your marketing materials to compare the startup costs of vented systems with that of the CompuFry. Invest in the website to make it easier to find information and be more interactive.